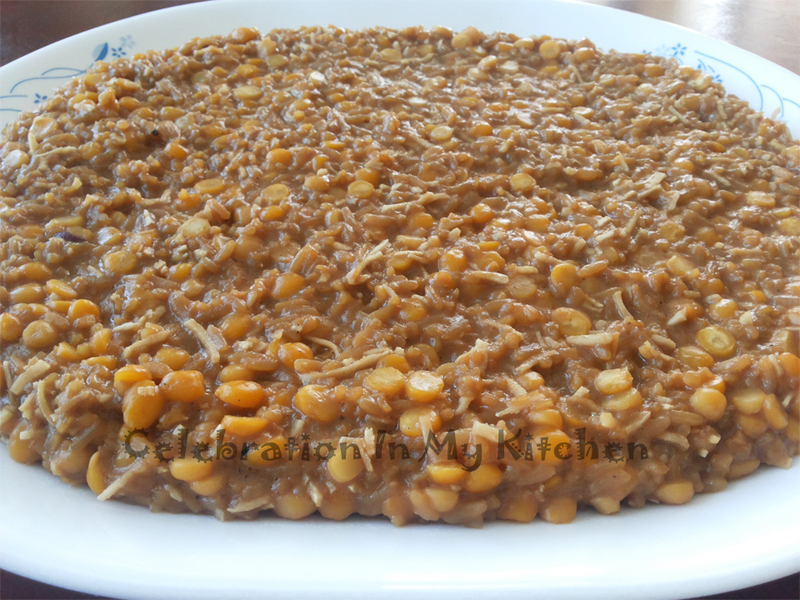 Godshem or pudding is a traditional Goan sweet dish. 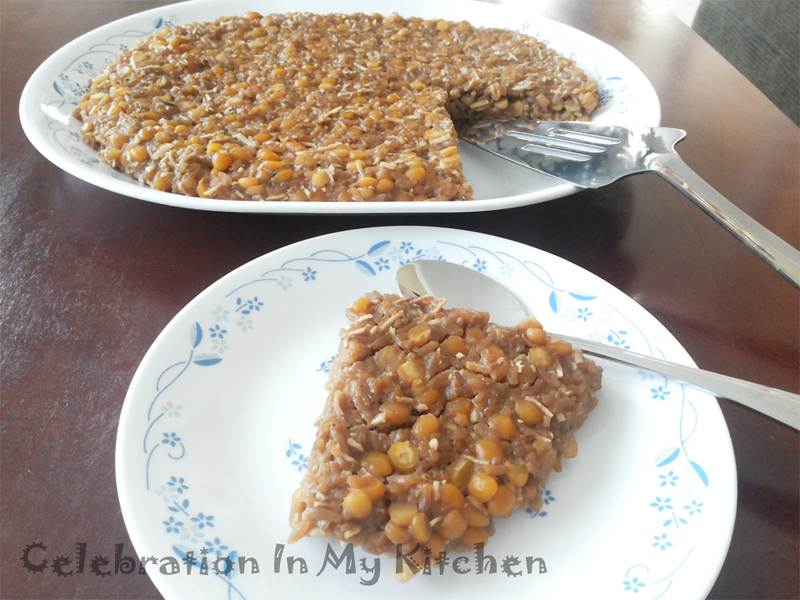 It is made with rice, lentils, jaggery, coconut and cardamom powder. Enjoyed at tea time, this pudding is nutritious and healthy. Sukhem means dry where the pudding is cooked down till all the coconut milk has been absorbed. The dry godshem when cold can be cut into pieces resembling slices of cake. For a porridge consistency, more coconut milk is added and the cooking process is stopped when there is enough liquid to savor. This pudding is usually made with leftover rice from lunch. Hence, it was ready to be served in the evening with a cup of hot tea. Soak chana dal and broken wheat (separately in two bowls) in warm water for an hour. After an hour, boil only chana dal with some water and a pinch of salt. The dal will be cooked in 15 minutes. Do not overcook the dal. Discard the white froth and the water. Drain off water from the broken wheat and put it in a pan with coconut milk. Place this pan on the stove. On medium heat, let the broken wheat cook in the coconut milk. Ensure to stir the pudding continuously. The broken wheat will cook very fast. Now add the cooked rice and jaggery in the pan. Keep stirring and let the rice cook and soak in the coconut milk, for few minutes. Next, add the cooked dal, cardamom powder and a pinch of salt. Do not walk away from the stove but keep stirring. The mixture will start to thicken. Towards the end, add grated coconut, stir and pour mixture into a dish. Enjoy godshem hot or let it cool, cut into pieces and serve. One pyramid was sufficiently sweet for the ingredients listed above. In case you would prefer it sweeter, add a teaspoon of sugar or more, according to your taste. This is a sweet dish so don’t add too much salt. Just a pinch of salt when cooking the dal and another pinch in the godshem. Use leftover cooked rice, preferably white. If you have access to turmeric leaves, add a small piece of a leaf in the godshem for flavor. Discard leaf before pouring mixture into the dish.